1973 was a great year for music: Pink Floyd released Dark Side of the Moon, Stevie Wonder released Innervisions, Herbie Hancock had Headhunters, The Stooges had Raw Power, Bruce Springsteen had his classic first and second(!) albums. And if you were a teenager in suburban Maryland with access to a car that year, you had access to a truly mind-blowing summer of music and entertainment, the likes of which are difficult to fathom today. 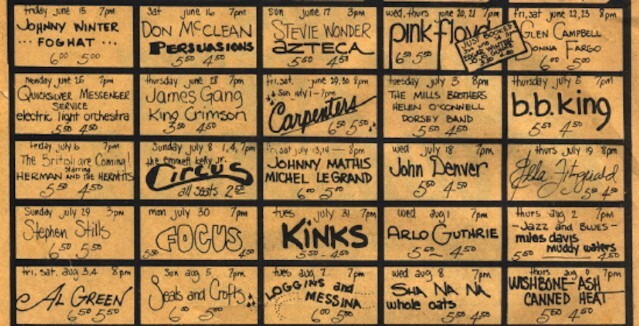 Take a look at the below calendar of shows from summer ’73 at the longstanding venue Merriweather Post Pavilion. It’s been kicking around the internet for a little while, and the writer John Lingan tweeted it out this morning, asking his followers to weigh in on their favorite three-night run of shows. I’m split between Stevie Wonder>Pink Floyd>Glen Campbell, Arlo Guthrie>Miles Davis and Muddy Waters>Al Green, and Cheech and Chong>George Carlin>Beach Boys. I was an adolescent living near Merriweather about 30 years after this, and though I saw some cool shows–Wilco and The Roots in 2005, Animal Collective on their victory lap after they named an album after the venue, Incubus and Ben Kweller in 2004, my first big show (it was a different time)–most of it pales in comparison to even a randomly selected night from this calendar. Teens of the past, consider yourselves lucky.